"stirrup." YourDictionary, n.d. Web. 09 April 2019. <https://www.yourdictionary.com/stirrup>. A flat-based loop or ring hung from either side of a horse's saddle to support the rider's foot in mounting and riding; a stirrup iron. A part or device shaped like an inverted U in which something is supported, held, or fixed. A rope on a ship that hangs from a yard and has an eye at the end through which a footrope is passed for support. 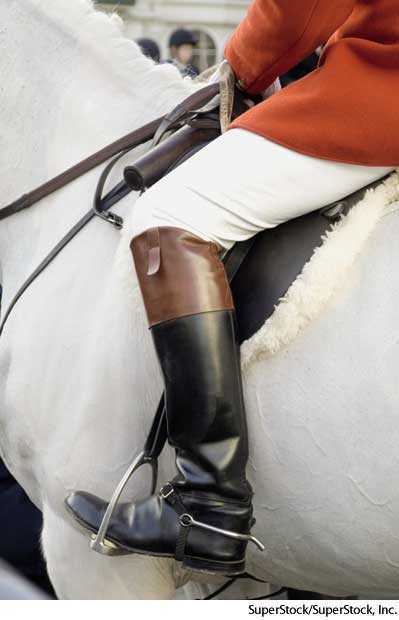 A foot rest used by horse-riders. Any piece shaped like the stirrup of a saddle, used as a support, clamp, etc. (nautical) A rope secured to a yard, with a thimble in its lower end for supporting a footrope. Referring to women's pants, a form of trousers commonly worn by women that includes a strap beneath the arch of the foot. From Middle English stirop, stirope, from Old English stiÄ¡rÄp (“stirrup"), a compound of stiÄ¡e ("ascent, descent, a going up or down"; related to stÄ«Ä¡an (“to climb")) and rÄp (“rope"), equivalent to sty +"Ž rope.